There’s no mention of exactly how the two products will be integrated, offered, supported, and maintained. Note: Web pages for VisIt at Lawrence Livermore National Lab appear to be offline. Also from Intelligent Light comes this case study on how automotive engineers can address their challenges using engineered workflows. 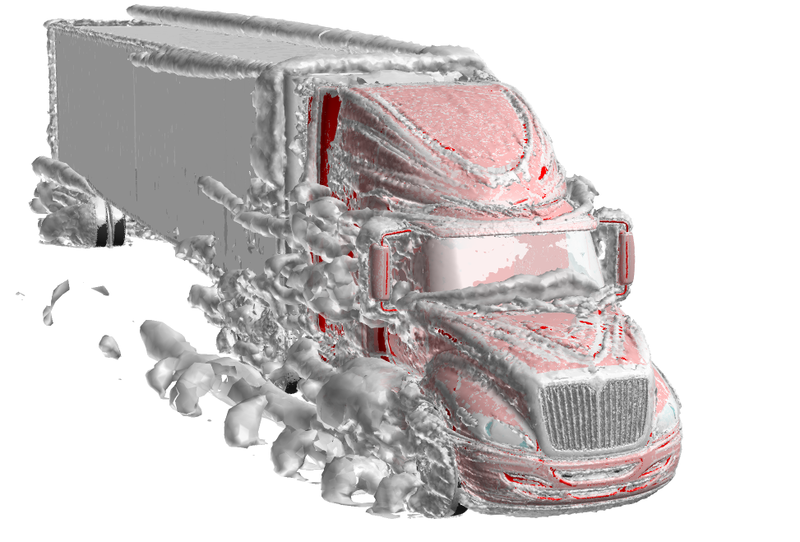 Rendering done in FieldView of flow over a truck. Image from Intelligent Light. When wind loads become a pacing factor in the design and operation of large ships and offshore platforms it’s time for a new, joint industry effort to develop standards for application of wind tunnel and CFD data. Flow Science published the FLOW-3D Newsletter for summer 2013 including an article about partially overlapping and conforming mesh blocks. Have you seen the OpenFOAM Code Style Guide? Here’s a CAD-oriented summary of SIGGRAPH. Will gITF do for 3D content what mp3 did for music? Speaking of SIGGRAPH, why is its attendance falling? How would you incorporate Disney’s AIREAL 3D haptic feedback device into CFD visualization? In this Life Upfront podcast Wayne McClelland offers presentation skills for engineers. [Hint: we all need help on this.] His one tip that you implement today to improve your presentations surprised me. intrinSIM and BeyondCAE announced a collaboration for helping engineering software firms go from technology to market. Z.J. Wang, organizer of June’s symposium Four Decades of CFD: Looking Back and Moving Forward, has written a brief overview of the event. The symposium honored the careers of CFD legends Antony Jameson, Phil Roe, and Bram van Leer. 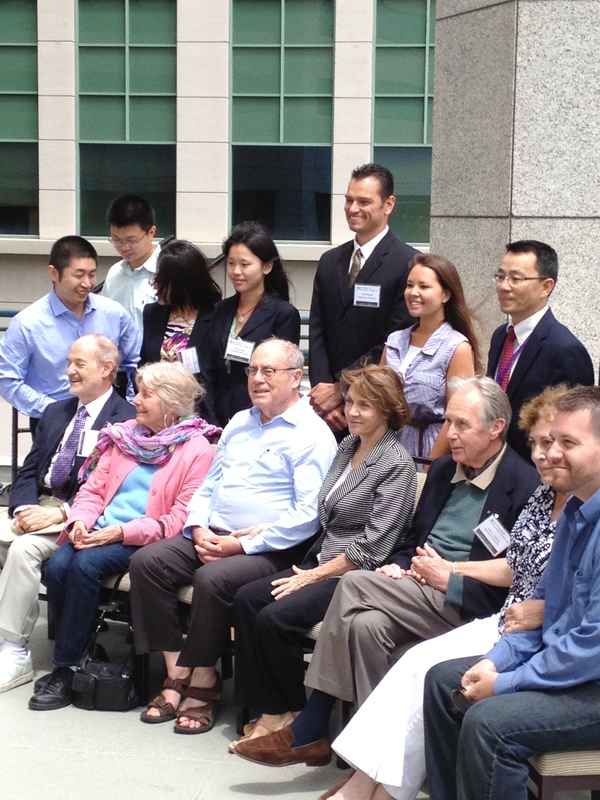 The guests of honor (front row), symposium organizers, and other guests at the JRV Symposium. New media artists James Susinno and Mark J. Stock (aka Axes) emphasize the increasing digitalization of humankind with Everything is Made of Atoms. 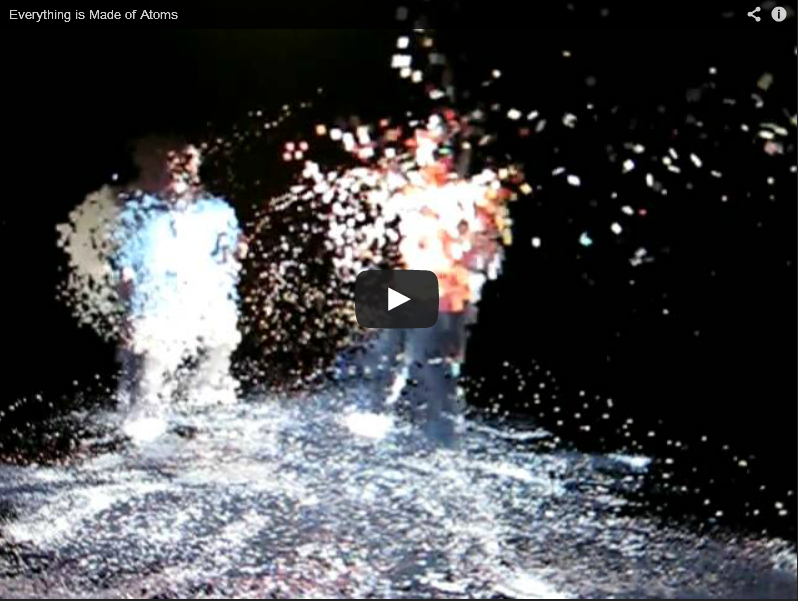 The installation consists of a Kinect for spatial imaging and a fluid simulation for effects that are displayed on a flat screen monitor with the result that the viewer can “interact” with their digital self. To me it looks like mesh cells being shed from a discretized person. This entry was posted in Hardware, News and tagged BeyondCAE, Flow Science, FLOW-3D, intrinSIM, OpenFOAM, visualization. Bookmark the permalink. John, love your teaser line on presentation skills… “His one tip that you implement today to improve your presentations surprised me.”… can I assume you found the tip a simple, yet useful surprise? Thanks, John, for the nice mention. Thanks for commenting, Wayne. Yes, the surprise was one of “a-ha” and not one of “yuck.” I suppose I would’ve gone for the old standard “don’t read your slides” but I suppose a positive tip works better than a negative. To a certain degree, I think engineers are shackled by the advice handed down over the decades of “tell them what you’re going to tell them, tell them, and then tell them what you’ve told them.” How much time have we all wasted looking a slide with bullet points that say “Problem Statement, Motivation, Deriving the Navier-Stokes Equations, Summary, Conclusions, Future Work.” I mean, c’mon – let’s get on with it. I gave a presentation for a research symposium series at Purdue, and for the most part, my presentation (and several others too! ) was structured exactly like this. I had a big smile on my face when I read your post. Out of curiosity, I’d like your view on what makes a good presentation, especially one that deals with technical details. Mukul, in my opinion (and that’s all it is) that structure is best used for the technical paper. It comes down to two things: who is your audience and what exactly is motivation for your presentation. It is very likely that the audience consists of engineers like yourself who already know the background information. So there is no need to repeat this information for them. And usually the motivation for a technical presentation is to demonstrate something new or different and therefore you should get right to that main point. As for your last question, a good presentation is one that motivates the audience to take some action even if that action is to simply feel informed or simply feel respect for you and your work. Other motivated actions might be to read your paper for the details, try to implement your work themselves, talk to you afterward, offer you a job, propose a collaboration, etc. Tufte has written 4 (or 5?) books various aspects of this subject and has a website. With a little googling you can get a much better idea of what I’m talking about. Mr. Chawner, thanks for that wonderful input. I will definitely try out some of your suggestions. The conventional presentation format, more often than not, does fail to strike a chord with the audience. I’ve made that mistake a couple of times before, which is why I was smiling when I read your post. Reviewing panels (at least the ones I have come across), expect some structure in the presentation. Then again, if I interpreted your post right, you were of the opinion that a good presenter knows how to convey information without sacrificing structure, yet steps aside just enough from conventional over structured methods to keep the audience entertained.How much to step aside, depends on the audience. I could not agree more – during presentations, there has to be a certain amount of interest in the actual PRESENTER, else, publish the powerpoint in a paper. Likely, those present are at your presentation because it offers something _other_ than a technical paper! Thanks for your comment, Andy. But I caution against placing too much emphasis on the presenter over the material being presented. It’s the presenter’s job to make the material shine, not the other way around.